In an earlier article, we examined legendary economist Ludwig von Mises' clear and convincing explanations why a government-controlled economy produces far fewer goods and services than a market-driven one. At the time he wrote, the controlled-economy fascist regimes in Italy and Germany were close to military defeat and the Soviet Union and Chinese Communism-based governments were just getting started. To be fair to lesser intellects than his, among which we number ourselves, it was not at all evident that a government founded on Marx's credo, "the greatest good for the greatest number," could not succeed economically. Today, we're more fortunate: it's been conclusively proven that it cannot. Mr. Alinsky didn't bother to state the obvious - the goal of taking power away from someone is to get power for yourself. He and his successors such as Hillary Clinton and Barack Obama have been organizing Chicago communities for the past 60 years, which is about as long as Communist economic theory was tested in Russia and China. Communism led to the economic collapse of the Soviet Union. The Chinese averted economic stagnation by switching to a market-based economy. The Chicago neighborhoods where Mr. Alinsky's disciples have spend the most organizing effort are the most violent places on earth. These ideas have been conclusively shown to be unworkable. Thanks to the commanding control of our institutions of education and news by leftist Social Justice Warriors, however, the modern-day heirs of Communist tyranny and Mr. Alinsky's theories, these proofs are often obscured, overlooked, lied about, or ignored. Conservatives, capitalists, and lovers of freedom have often been too occupied with other things to do the hard work of persuading their fellow citizens exactly why a market economy and freedom are better than bureaucratic chains. Let's look at some specific examples you can use to convince those who are inclined toward a communitarian style of government that a competitive market system produces the best economic outcome - for everyone, including most especially the poorest people. The Chinese took their nation from third-world poverty to close to first-world wealth in 30 years by letting entrepreneurs create new businesses and add societal value. The Venezuelans, through the economic disaster of community organizing and government control, took the Venezuelan economy from being the wealthiest in South America to the point of not being able to supply toilet paper. This diagram is our favorite visual to demonstrate that government control of the economy leads to universal pauperism whereas a market-based economy generates far more wealth. For decades after Mao's communist takeover, the Chinese economy flatlined. Mao's associates were so serious about guaranteeing economic equality for all citizens that they killed anyone who tried to start a business and guaranteed everyone employment in a State Operated Enterprise. They achieved economic equality in that everyone except for a few favored comrades was equally poor. Their economic results prove von Mises' assertion that a bureaucratic system is unable to generate economic growth because growth requires change, innovation, and risk, all of which are anathema to any bureaucratic organization. Chinese "animal spirits" or entrepreneurial initiative did not abruptly change in 1980; what changed was the government's attitude toward market capitalism. Mao's successors recognized the truth of his assertion that power grows out of the barrel of a gun, but they had learned that guns cost money and that government employees who carry the guns have to be paid. Once Leader Deng convinced the bureaucracy that he was serious about permitting private enterprise, the economy took off like a rocket. Today's China is a middle-income country which, although it has some problems, shows no overall sign of slowing down as long as the government stays out of the way. Inequality has increased greatly, of course, but the people at the bottom of the economy are far better off than they were. Chinese peasants, like American welfare recipients, are now able to afford smart phones thanks to a few capitalists who became very wealthy by assuming the risk of developing and offering phones which people chose to buy with their own hard-earned money. Andy Stern, the head of America's government employee's union, visited China. He, of all people, figured out the secret of economic growth, which we explained in "Andy Stern's Chinese Lantern." Briefly put, it's a streamlined government that, while cooperating with businesses, mostly gets out of the way of wealth creation. The Chinese experience shows that all that government has to do to create growth is create a judicial system which is independent enough of political pressure that business contracts can be reliably enforced. Infrastructure helps, of course, and the Chinese government is investing some of its new-found tax revenue on high-speed rail, better roads, and airports. Otherwise, the best thing government can do is to get out of the way, as the Chinese government has been progressively doing for the past several decades of tremendous growth. The economic history of the last 60 years shows that a tightly-focused autocratic government can help in getting from Third World status to Second World, or middle-income status. Many of the Asian tigers followed this path, like China, South Korea, Singapore, and arguably Malaysia and Thailand. The United States government did likewise in our early years, sheltering domestic manufacturers behind tariff walls. Some of our readers have complained that the diagram doesn't go far enough. They correctly point out that the Chinese economy has had its share of stumbles over the past few years. Though the delta accounts for less than 1% of China's territory and 5% of its population, it generates more than a tenth of its GNP and a quarter of its exports. By establishing the Special Economic Zone, the Communists got out of the way and encouraged the formation of private businesses within the designated area just as the Taiwanese government had done years before. The SEZ has averaged 12% growth per year over the last decade. The major reason for their periodic economic difficulties is that the Chinese government hasn't fully backed off from controlling the economy in the rest of the country. Government has to start getting out of the way as the economy gets too complicated for anyone to manage. One reason the Japanese economy slid into the "lost decades" at the beginning of this millennium - and largely is still in them - was that the government bureaucrats refused to give up their power over the economy even after their interventions lost effectiveness. By the time an economy advances to the level of the First World, the economy is far too complex to be managed by any group of human beings regardless of their brilliance or the purity of their motives, but neither the bureaucrats nor liberal politicians will admit this. The government's economic goal should be to maximize economic growth because this also maximizes personal wealth for all citizens as well as tax revenues for politicians to spend on gifts to their friends. For this to work, government has to be Jeffersonian, as in "that government is best which governs least." If only our own leaders would admit that! China illustrates the grinding poverty that von Mises said resulted from a centralized bureaucratic system and which Jane Jacobs said was the natural state of society. China was a very poor, agricultural country when the Communists took power, and their policies didn't improve things any. Their practice of killing all businessmen and "capitalist roaders" kept everyone equal, but everyone was equally very poor (except for Mao and his immediate associates, of course). When Mao's successor Deng commanded the bureaucrats to let loose the Chinese "animal spirits," the economy took off. There was a downside to becoming wealthy, however. A friend who was born in central China in the 1950s immigrated to the US and teaches in an American college, but visits China regularly. In her childhood, everyone was very poor, but everyone cooperated and helped each other. "Now that we are so wealthy," she said, "everyone is much more selfish. Nobody looks out for anybody else." It's not that masses of Chinese people lost altruism as the economy grew. In a poor society, people must cooperate to survive at all; those that don't simply don't make it and are removed from the gene pool. The need for cooperation diminishes as wealth increases. Wealthy people look out for #1 because they don't think they'll ever need help, and because more often than not, they're right. Their money is all the help they need. As von Mises pointed out, the main problem with an economy run on a bureaucratic basis is that there is no way to measure whether any individual or organization is doing something worthwhile. In a market system, it's easy to decide. If a business persuades enough people to voluntarily buy its products or services, the money they give the business shows how much they value whatever it produces. In a bureaucratic system, there is no way to measure value. How can we put a price on the police department? All we can do is set the budget and write a bunch of rules which supposedly manage the police department to some degree of efficiency. There is one exception to not being able to measure bureaucratic output, and the costs that a bureaucracy imposes. It comes into play when you have a very simple economy. As the Japanese rebuilt their society after the destruction of World War II, the government had to set priorities such as building roads, repairing railroads, hospitals, schools, the electric grid and many others so as to increase overall national output as rapidly as possible. They had next to no economy because it had all been bombed flat, and it made sense for someone central to decide whether it was more important to build roads, railways, or electric lines, and where. Coming from such a low collapsed base, economic growth was a fairly reasonable measure of the overall effectiveness of the government's planning efforts. The problem arose because the Japanese government should have relaxed control once national wealth grew to the point that the economy was too complicated to be managed bureaucratically - say, somewhere around 1960 or 1970 at the latest. Unfortunately, recognizing that this would be career suicide, the bureaucrats resisted, and the Japanese miracle started to slow down. Japan's economy continued to boom through the 1980s, but by the 1990s slid into the "lost decades" since then. Memories of 80s-era American fears of Japan owning the world are laughable. Similarly, the Chinese economy would grow a great deal more if the government would let go of the rest of the country as they did in the Pearl River Delta. Having less control would make it harder for the local bureaucrats to grow rich, however, so they don't want to do it - but, over the years, their masters have forced them to let go by degrees. Although the Chinese economy is smaller than the American economy, the greater degree of government control remaining has make Chinese politicians significantly richer than American ones. For instance, according to "Billions in Hidden Riches for Family of Chinese Leader," New York Times, Oct. 26, 2012, P A1 Prime Minister Wen Jiabao and his family are said to be worth $2.7 billion. No American politician, not even the Clintons, have stolen even remotely this kind of wealth. The 50 richest members of the China's National People's Congress are collectively worth $94.7 billion-60 times as much as the 50 richest members of America's Congress. Given their desire to keep stealing, it will be very hard for the Chinese rulers to open the economy up any further. If they don't, however, the 95% of Chinese who do not live in the Pearl River Delta or major cities won't be able to afford all the air conditioners, cars, and other consumer goods they desire. This "revolution of rising expectations" will give the bureaucracy trouble if they don't loosen up. 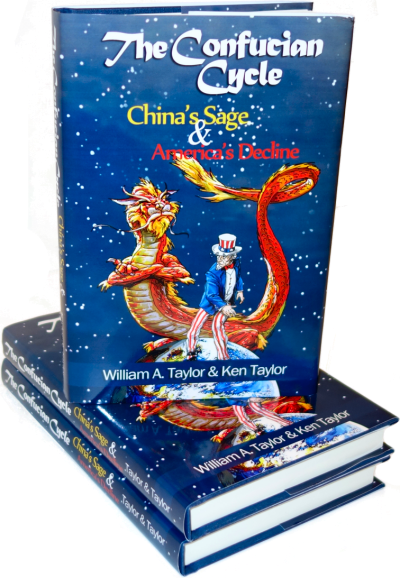 Our book The Confucian Cycle: China's Sage and America's Decline shows that society collapses when government imposes more costs than society can afford. Chinese rulers know this fact of history quite well, and, like any intelligent cancer or gangster, have limited their theft to what the economy can afford. There is no limit to bureaucratic greed, however, so it's not clear they can fulfill their increasing desire for plunder without either collapsing the economy or setting the rest of it free enough to create more assets for them to steal. Countries which suffered under the curse of bureaucracy accepted new forms of government in times of economic distress. Germany, Italy, China, and Russia suffered greatly from World War I and its aftermath and then suffered more from the Great Depression. Saul Alinsky's rules for community organizing were designed to disrupt society and acquire power. His theories of making the nation ungovernable were used by Hitler, Stalin, Mao, and Mussolini. They knew that when people lose faith in the ability of government to keep order, they want someone powerful to take over and make things work. These men had no need to create chaos because their nations were in chaos at the time. This doesn't mean that chaos is needed for a bureaucratic system to be imposed on a prosperous economy. At the time of Mr. Chavez's "Bolivarian revolution," Venezuelans were the wealthiest citizens in South America. As a result of the economic mismanagement that followed Mr. Chavez's re-organizing their community, Venezuelans can no longer afford toilet paper and pregnant women walk across the border to give birth in Columbia for want of medical care nearer home. Leftist policies of redistribution, heavy regulation, and raising taxes so that "the rich" pay their "fair share" always lead to poverty. The left won't admit that their policies lead to poverty; they always claim that they're smarter than those other community organizers, and they'll never admit that poverty exists in socialist paradises like Cuba or even in Venezuela. They can't argue with Chinese success, however, which is why we present the "China dream" as evidence that economic success requires a freely-operating market system.